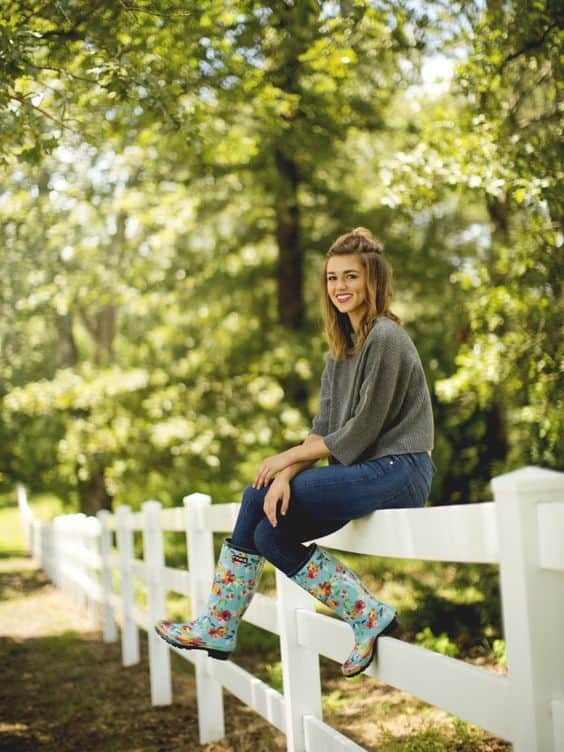 It might be inappropriate to wear rain boot in sunny weather but when the rain season kicks in we all start thinking of ways to wear rain boots without looking boring and dull which is a hard task you know! Yeah it depends on the type of wellingtons you have but what you match these boots with will also make a difference. We all know that rain boots are a rather functional piece of footwear. We mean who cares what they look like as long as they protect you from getting soaking wet right? No, not right. 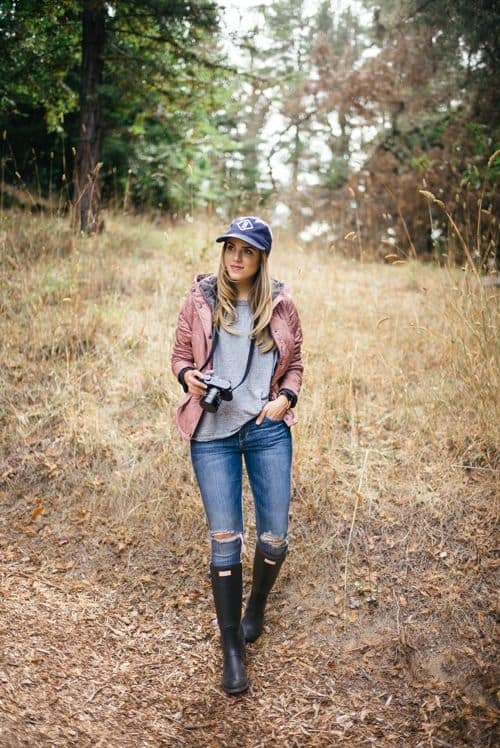 Most women spend hours trying to wrap their heads around how to wear rain boots and not look like an old smelly fisherman and we’re ready to save you the bother sharing the besttips we could come up with. 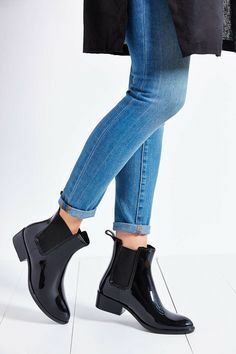 High wellingtons look great with skinny jeans or pants, that’s for sure, but they also will look super edgy with shorts or mini skirts, if it’s not freezing outside of course. Considering that there’re more options now than just green or black you’ll definitely find something to suit your taste in fashion. 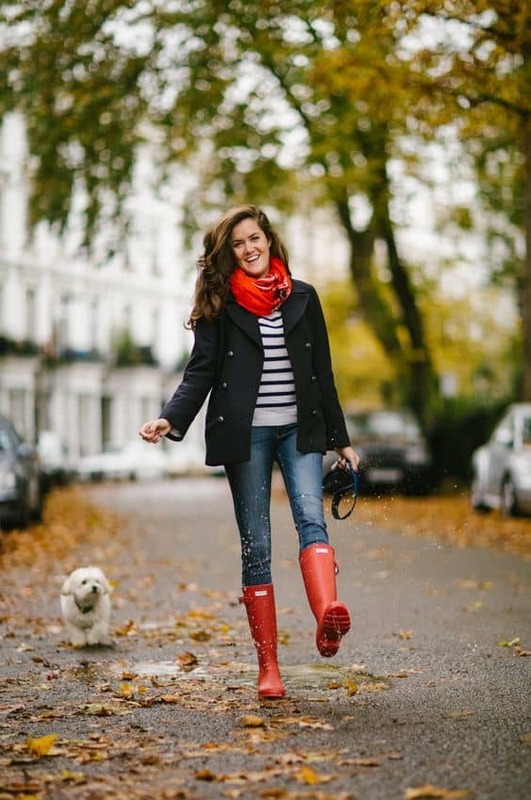 If it’s not raining and you feel uncomfortable wearing rain boots when the weather is fine there’s a way round it: as long as you’re at the seaside or close to any type of water wellingtons look kinda OK and natural. You don’t really have to think of what to wear with rain boots cause most of them will go well with any outfit you’ve chosen. Yes, even a dress. And a coat. And a leather jacket. Unless you’re dressing up for a formal meeting or a fancy event. Then there’s fat chance you’ll pull off this look, so just put on your pumps, take a cab and save yourself the bother. BTW: If you wanna use rain boots as a fashion piece you’d better change your mind cause you’ll feel far from cozy in them: when it’s hot your feet won’t be breathing and your feet will be sweaty and smelly, and when it’s cold you’ll freeze your feet off! 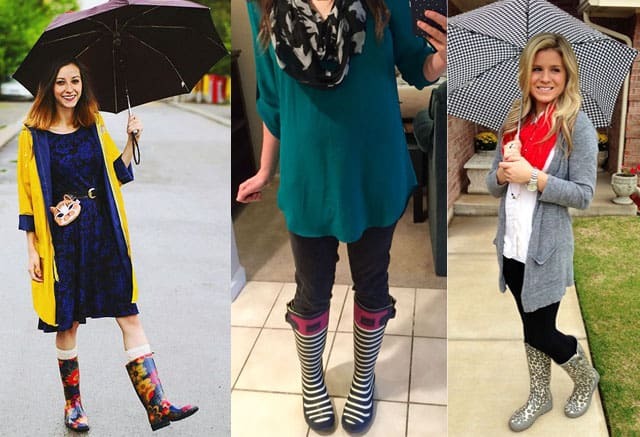 You’ve probably fallen behind a bit and do not know that rain boot now come in all shapes and colors which sometimes can literally rock your world. Classy black and hunter green are no longer the only options even though they still look so damn good. Here’s what you can go for if you’re adventurous enough. Extreme colors. Whether it’s neon green or vivid red these wellingtons will make for catchy rain boots outfits if you’re bald enough to risk wearing them. The elastic patch might let some water through but unless it’s flooding you won’t get wet, even though these ones look not as safe as solid boots. Who cares if they look this good! Diverse prints. Go for polka dot to create girly cute looks with rain boots or sculls and roses to show who’s the rock star here. Either way prints will bring out your personality which is really priceless. Make sure your socks aren’t odd! Just kidding. 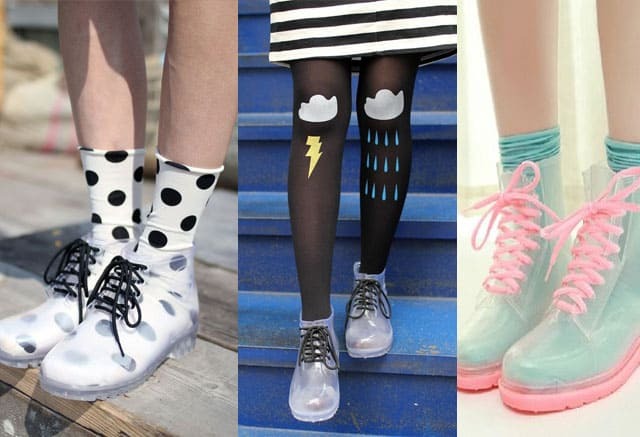 Maybe odd socks under transparent rain boots will become a new trend one day. Change the design by changing your socks: the crazier the better! Lace up. 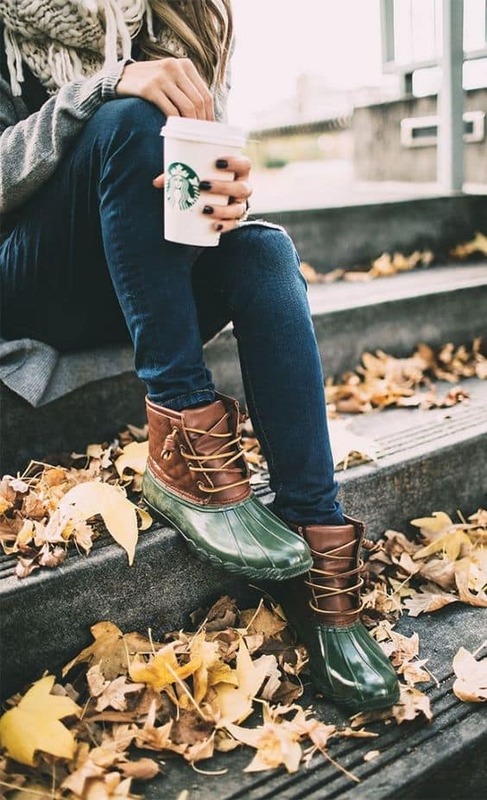 They’re not that waterproof again, but they look so crisp you won’t lack rain boots outfit ideas if you get yourself a pair of these. If you still believe in magic make some room for it in your everyday life wearing these shiny babies. Uncommon height. 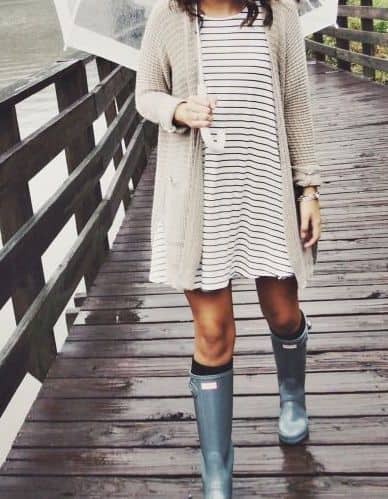 Over-knee long or super short rain boots are less common — that makes your look even more extraordinary! 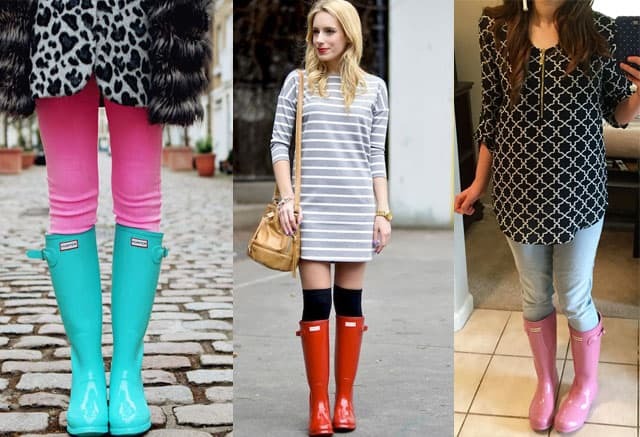 Tip: There’re rain boots with a zipper which fit your leg really tight and look like potent leather if you don’t pay close attention, so if you can’t stand the look of regular rain boots because of their non-feminine shape you might want to try and find this style instead. How to Wear White Coat?